This article can also be found at EAGnews.org. These questions were written for use in the classroom by Grant Wiggins, a Pearson Education author, partner, and Common Core professional development trainer. In partnership with the Council of Chief State School Officers, Pearson Education provides lessons, texts, professional development, and other resources to states implementing the Common Core State Standards. Wiggins is one of several educators and authors who provide instruction via Pearson Common Core webinars. James Rubenstein, author of, The Cultural Landscape: An Introduction to Human Geography, is also employed by Pearson. Last year, it was reported that parents in Tennessee’s Williamson County School District were calling for removal of Rubenstein’s book, a resource for Advanced Placement Human Geography courses, because of its anti-semitic content. 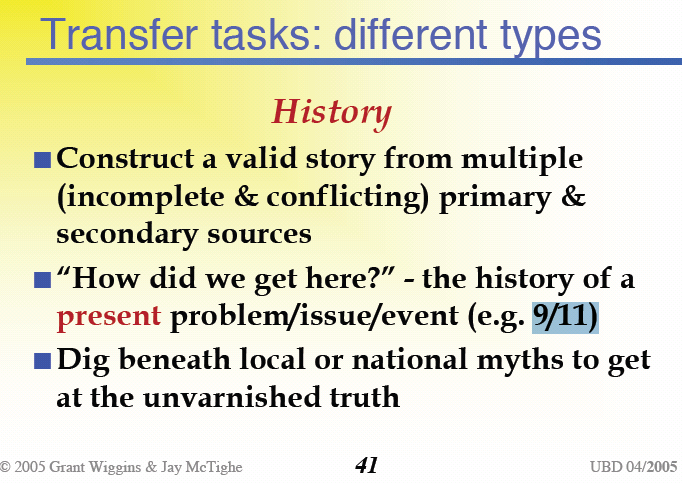 In this Pearson Common Core webinar, Grant Wiggins explains “how issues of backward transfer relate to the Common Core”. ‘Backward transfer’ (also referred to as ‘backward design’ or ‘planning backwards’) is part of the Understanding by Design framework for curriculum, assessment, and learning created by Wiggins and co-author, Jay McTighe. As explained in The Real History of Common Core: Black Helicopters…’, Common Core’s Achieve, Inc. Far From Bi-Partisan, and Carnegie Corporation: From Philanthropy to Frightening Control to Common Core, the Coalition of Essential Schools is the whole-child progressive indoctrination reform behind the Common Core State Standards Initiative. Wiggins and McTighe have worked with the Coalition of Essential Schools (CES) for many years as research scholars, studying CES method, pedagogy, and curriculum, and incorporating them into the creation of their own curriculum and instruction design. A staple of CES reform has long been the use of ‘big ideas’ and ‘essential questions’ to identify desired results of teacher instruction. Stage one of Wiggins and McTighe’s backward design process, which Pearson recently committed to integrating into all new programs, is identifying those essential questions. The Common Core standards call for students to think critically about the world around them, and essential questions do just that. For example, at a school founded and led by CES co-founder and Marxist-socialist, Deborah Meier, questions like, “Whose country is this, anyway?”, are considered “higher-level” essential questions. According to Meier herself in this recent post, Who Owns America, America doesn’t belong to us, nor does Israel belong to the Israelis. With the recent influx of liberal minded educators (also by design) and biased Common Core aligned texts and lessons from Pearson, Crayola, Discovery, and other CCSSO partner organizations, we see these methods of teaching being used more and more to indoctrinate students through Common Core. Even absent the biased Common Core resources, teaching strategies like backward design and essential questions are effective in imposing the political and moral bias of the educator onto the student. As Wiggins and McTighe state here, “the questions ARE the core curriculum, the “content” is not.”. 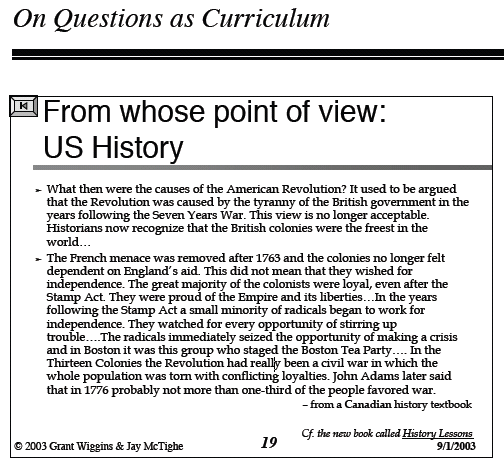 Compare the Wiggins and McTighe lesson plans below to this lesson discovered in Texas that referred to the Boston Tea Party as an act of terrorism, and this one that said the 9/11 terrorist attacks happened because of bad decisions made by America in the past. In 2011, the Bill and Melinda Gates Foundation partnered with Pearson to create a “complete, foundational system of instruction built around the Common Core Standards”. Judy Codding, former president and CEO of America’s Choice was appointed to lead the course development effort at Pearson. Codding was one of four charter principals who participated in the creation of Ted Sizer’s Coalition of Essential Schools. Now, as managing director of the Common Core Initiative at Pearson, Codding, along with several other shameless CES educators, including Wiggins, McTighe, and Pearson Foundation Vice President of Programs Susan Sclafani, are being paid to bring their indoctrination techniques and anti-American views to millions of teachers and students via Common Core. This entry was posted in COMMON CORE/CSCOPE/CES CONNECTION, WHAT ARE THEY LEARNING? and tagged anti-American, anti-Semitic, backward transfer, CES, Coalition of Essential Schools, Common Core, essential questions, Grant Wiggins, Jay McTighe, Meier, Pearson Education, Sizer, Susan Sclafani, Understanding by Design. Bookmark the permalink. If indeed, the tyranny of the British government was not the cause of the American Revolution, what was? Well, it was the radicals who wanted independence so they could control the new nation and wield power over the people. And the Founding Fathers waited 238 years for the process to begin. Very clever.